Issue reproted by OP: png, gif, svg, xpm (maybe more) do not open with correct application. 1) When changing the default image viewer in from 'Image Viewer' to 'Shotwell Viewer' a double click on any image should open the image in 'Shotwell Viewer'. 2) When changing default video player, all video files should open using that app. 3) When changing default music player, all music files should open using that app. 1) When clicking on a png, gif, xpm or svg file Ubuntu will open them in 'Image Viewer' instead of the system default image viewer → 'Shotwell Viewer'. 2) Videos open in Totem even though VLC is selected to be default. For a dev png might be not an image format but for the people out there - they don't know what the differences of jpg and png are and when to use the one or the other. The reason I use 'Shotwell Viewer' is because of its editing skills, for the rest I don't see (as user) any differences to 'Image Viewer'. I changed both video and audio to be handled by default with smplayer (I actually suggest making it the default player in the upcoming release). However, if I now go to an audio or video file, and double-click them, they still open in Rhythmbox and Totem (respectively). Changing default applications doesn't work yet in 12.04 Beta 2. I think this is related, just not well described. I think I remember that this kind of feature didn't work in MS Windows either. The way I understand this feature is whatever application is set as default application should be tried first to open a file with a probable extension. > Issue reproted by OP: png, gif, svg, xpm (maybe more) do not open with correct application. > 1) When changing the default image viewer in from 'Image Viewer' to 'Shotwell Viewer' a double click on any image should open the image in 'Shotwell Viewer'. > 1) When clicking on a png, gif, xpm or svg file Ubuntu will open them in 'Image Viewer' instead of the system default image viewer → 'Shotwell Viewer'. > 2) Videos open in Totem even though VLC is selected to be default. Yes, but as you know, the main point is that there is no functioning GUI for setting default applications. 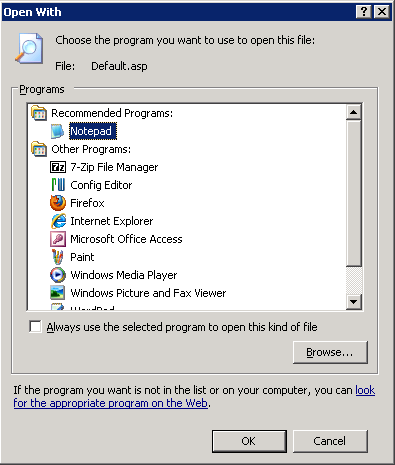 The user should be able to choose/change which applications launch for each (an unlimited number) file type. Look at the attached screen shot. Notice how Ubuntu's "Open With" feature is missing the "Always use the selected program to open this kind of file" check box. Actually there is such an option, just at another place. When you right click on the file and go to properties, there is a tab called "Open with"
it lists a number of applications and you can choose one and click on "Set as default". In my option this does suffice. Having a global option, as in the bug I opened (which is a duplicate of another bug), I think would make it even more user-friendly. Otherwise I don't see the use of having the Default setting control panel under settings, when that setting doesn't have any effect. >Look at the attached screen shot. Notice how Ubuntu's "Open With"
>kind of file" check box. Yes, that method works (thank you), but none the less (for user-friendliness' sake), you should provide such options where they're most commonly used; put a check-box in the open with dialog (see attachment). However, link above is not directly related to the bug we're discussing here; it is indirectly related though. >here; it is indirectly related though. Is there a quick fix for this? I tried entering "xdg-mime default totem.desktop audio/x-mp3" to make Dash launch totem for my mp3s but it still launches RhythmBox. right click on a file in nautilus? I'd like to get used to dash. It makes the hassle of opening up nautilus and double clicking on files go away. I remember I didn't used to have this problem. But if there's not a fix then I guess I'll have to stick with what I know. Right click on a file that is of the type you want to change. Click on the open with tab. Reference for #19 can be viewed in nautilus user-guide. Thank you for the information. Interestingly, I used https://bugs.launchpad.net/ubuntu/+source/gnome-control-center/+bug/876897 and my application did not appear. There was no option to add it either, so I settled for another. The reason I wanted to change it in the first place is that Shotwell takes forever to load to view pictures. I have settled for Image Viewer. nautilus in Ubuntu: how do I add a default application to my system settings for opening pictures?